Madurai on the banks of River Vaigai flourished during the Chandragupta Maurya Empire (3rd century BCE). 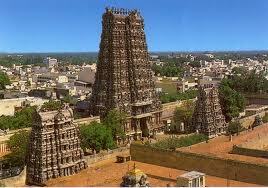 Madurai city is geographically called ritual peripheral city of Meenakshi Temple. It is important to know that the first Madurai king redesigned the city structure according to Silp Sastra. The temple city is one of the perfect destinations for south India tourism. The temple town is home to many poets and artisans as it holds abundant literacy wealth of classical and modern Tamil. Other than Tamil, another common language in the city is Saurastrian spoken by the migrated Gujarati communities in early 16th century. The most important attractions of Madurai are Rajaji children's park Gandhi museum and the Tamukkam ground other than Meenakshi Temple. The annual 10-day Festival of Meenakshi Tirukalyanam festival, also called Chittirai festival attracts more than one million visitors a year. Because of Madurai’s night life style, Madurai is called Thoonga Nagaram which means the city never sleeps. Kazimar, the first Muslim place for worship is also a special attraction for tourists. Rice farming is one of the main occupations in Madurai. It is believed that the Greeks had direct trade connection with Madurai market. Rubber is another big industry that contributes to the Madurai economy and it has identified India as a natural rubber source for the globe. Since the automobile revolution in India, Madurai is famous for Automobile rubber production source. 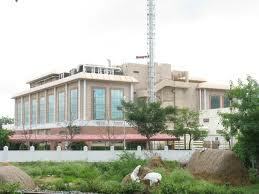 Being one of popular religious centers of Tamil Nadu, Madurai Market provides income for 200 flower farmers. Automobile companies like General Motors, Ford, Toyota and Honda are the major consumers of components produced in the city. Situated at an average elevation of 101 metres, Madurai experiences a moderate climate during the months of February and March. Madurai City spreads it ends on flat ground of Vaigai River and extends to it both side streams. Normally, eight months of the year will be faced with hot and humid winds blows around the district. Cold winds can be felt during January and till mid March. During summer, the temperature reaches till 40 degree and makes humid feeling with sweats. In winter, the weather goes to maximum 10 degree with little fresh feeling of winter. It is important to know that Madurai is famous for its festive spirit and they are celebrated with great enthusiasm. The temple city celebrates a number of Tamil festivals such as Pongal, Dance Festival, Chithirai Festival, Float Festival, Jallikattu and much more. Celebrated in January, Pongal is termed to be a traditional festival of Madurai and Tamil Nadu. This festival is mainly celebrated to honour Lord Surya and people express their gratitude to God for a good harvest. Another important festival in Madurai is the float festival that is celebrated on the full moon night of the Tamil month. During the 17th century, this festival was initially celebrated by King Thirumalai Nayak and he constructed an artificial tank dedicated to Lord Vigneswara. The Dance Festival in Madurai is usually held between the months of November and March. It is organized by the Tamil Nadu Tourism Department in which exponents of various dance forms come and perform. During the festival season, the city’s temples are decorated with fluorescent tubes, colored electric bulbs, flood lights and much more. The festivals in Madurai are unique in its celebration and ensure to attract thousands of business travelers and pilgrim visitors to the city.